How often do you get the chance to climb aboard a 350-ton Baldwin steam locomotive? Imagine yourself as the engineer of this massive engine in our simulated train factory. You’ll feel the heat of the steam and hear the sounds of the machines as you learn about the science and technology of trains. 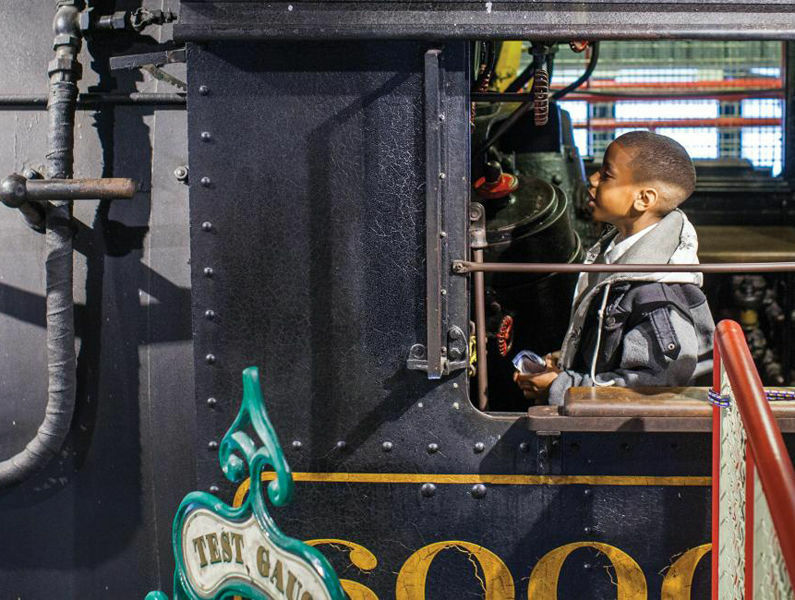 Learn firsthand how steam and coal powered the first locomotives and discover how diesel, electricity, and magnetic levitation are used to power modern day locomotives to travel longer distances at greater speeds. This is an authentic learning opportunity for exploring physical science concepts like energy, pressure, friction, and magnetic force. Look for simple machines in the workings of the complex design of the steam locomotive. With propulsion provided by steam, the states of matter are also on vivid display. All aboard! Next stop: The Train Factory!